Gmail is a great webmail service, with features rivaling standalone clients. But since it runs in a browser, if you're not on the site, you won't be notified of new mail. Spiffy (free) fills this gap. 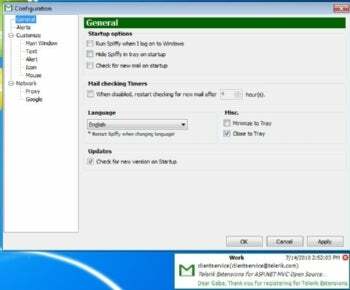 It runs in the system tray and periodically checks up to five Gmail accounts, displaying alert boxes for new messages. Spiffy's alert boxes pop up right above the system tray. Spiffy is lightweight and free, and allows detailed customization of the behavior and appearance of the alert boxes. This is a welcome improvement over Google Labs' barely customizable Gmail Notifier. One particularly useful option stops Spiffy from redisplaying messages, so spam that you don't want to bother to mark as read won't continue to plague you. The alert box contains the title, subject, sender, date, and first few words of the message, and you can position and color each of these parts. All the basic options you'd expect are there too, such as how frequently Spiffy checks for new mail. On the more advanced side, Spiffy also supports proxies. When you click on the message text in an alert, Gmail launches in a new browser window. It would be nice if Spiffy offered a quicker way to view the rest of the message. But Spiffy seems to be targeted towards those who prefer the Gmail Web app over any type of standalone client, and just want to be on top of new messages. For this use, Spiffy is perfect.